This unique shade combination provides the ultimate in versatility. 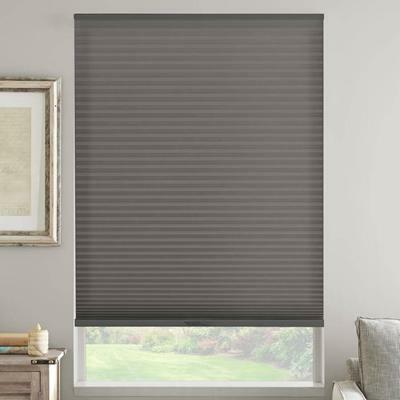 Combine a Sheer Pleated Shade and a Cellular shade for better ultimate light management, UV and glare reduction, privacy control and energy efficiency. At least one remote is needed per order. Remote can power up to 5 shades at the same time. It is most convenient to get one remote per room. Plugs into rechargeable shade. Provides constant trickle charge to 7.4v Li-Ion Rechargeable battery packs. Have extra-wide windows? 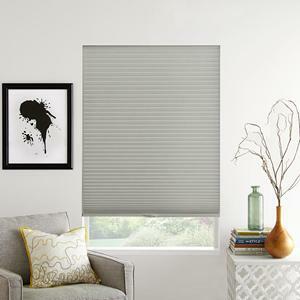 Premier Classic Single Cell Light Filtering Shades are the perfect solution. We can custom make a single headrail up to 84” wide. 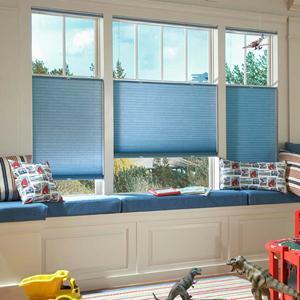 Mount them side-by-side to create a unique window treatment that’s a real treat for the eyes. And forget the blah beige of early honeycomb-style products. Energize any room with these energy-efficient window coverings in delicately patterned designer colors. You’ll find just the right ‘shade’ to fit any room and complement your own special style. Made from soft, thick-spun lace fabric, the ¾” energy-efficient pleats also help absorb noise while keeping you cool and comfortable year-round. With the energy savings these premier light filtering products can provide, you can even afford to upgrade to our lowest-priced motorized lift system for easy, remote control of those hard to reach windows. In addition to other favored lift styles, Select Blinds is proud to offer a Certified Best for Kids Cordless Lift & Lock™ or Cordless Top Down/Bottom Up Lift & Lock™ system to keep young children and pets safe from dangling cords. Corded top down bottom up- Left cords operate bottom rail. Right cords operate center rail for top down. Standard inside mount brackets are top mounted. Side mounting brackets available upon request for shades under 48" wide only. Cordless Lift & Lock™ Top Down Bottom Up shades will come with attached magnets and striker plates in center to provide tight closure. Shades over 42" wide will have striker plates approximately 4" from the edges. Shades 12" and under have a max height of 80"
Headrails and bottom rails will vary based on lift style. It is recommended to order the same lift system for shades in the same room. Standard lift and corded top down bottom up do not come with fabric-wrapped rails. Adding hold down brackets to inside mounted shades will increase headrail deduction to 1/2". This is done to make room for brackets. Motorization remote and charger are not included. At least one remote and one charger is needed per order. Battery charge will last ~6-12 months based on an average-sized shade raised and lowered once a day. Battery can be recharged up to 500 times. It takes approximately 5 hours to recharge the motor when fully depleted. Add optional solar charger for a constant trickle charge. Solar charger plugs into motor and can be mounted to the back of the headrail or side of window sill. Flush inside mount with solar charger requires at least 4" depth. Motorization 5-channel remote includes one 3V battery, that can power up to five (5) individual or five groups of window treatments. Remote range is ~80'. (Do not let antenna on headrail motor touch any metal objects, as this may interfere with signals from the remote control.) At least one remote per room is recommended. Motorized products installed in windows with metal casings may have a reduced radio frequency range, or may not operate at all, depending on the application. I have installed plenty of blinds in my life, so I can say that these were the easiest to install. Normally, it is hard to get the drill in the right angle, but the brackets are made so you don't have that awkward angle. I love the top down option on the shades. It lets in all the light, but gives you privacy. The best part is that the top down option was free. I can't believe that I lived without that option for so long. Great blinds. Purchased 2 blinds. Installation instructions were very clear and the final look is professional. I have bought like "name brand" shades for another room from one of the mega home stores but these where less cost and no discernable difference in quality. Very easy to install and look great. If I was to have one complaint it is the cordless top down/bottom up type I bough when I close the top the bottom comes up a little too requiring me to close the bottom again. we had a problem with receiving our blinds and had cancelled the order. We received an email the next day and was told we could get our blinds at no cost if we still wanted them. we said yes and got blinds the next week! very few companies would offer this kind of service. thank you and i would order from them again.